For analysts and therapists, working in intimate clinical settings, ethics is at the foundation of professional life. Yet the various depth psychological models have yet to provide an understanding of the relationship between professional ethics in the clinical setting and the origins and developments of the ethical attitude in the individual. This work seeks to remedy this omission and brings together practising psychoanalytic psychotherapists and Jungian analysts to explore the impact of the ethical dimension on contemporary analytic theory and practice. The book presents a series of in depth studies all written by practising analysts with a particular interest in professional ethical matters. Among the issues discussed are: the ethical implications for the analyst contemplating and negotiating the stages of retirement; the pressures in the analytic relationship that may contribute to unethical enactment’s; the ethics involved in the sensitive area of publication and the dissemination of clinical material; and the ethical requirements for analysts working in the wider contexts of society, including mental health provision. 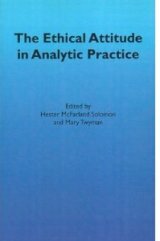 In a climate in which analytic and therapeutic practice is highly scrutinised by the public and the media, “The Ethical Attitude in Analytical Practice” by Hester Solomon and Mary Twyman makes an important contribution to the place of ethics in analytic theory building and day-to-day clinical practice, and in the psychoanalytic understanding of wider social and cultural ethical issues.